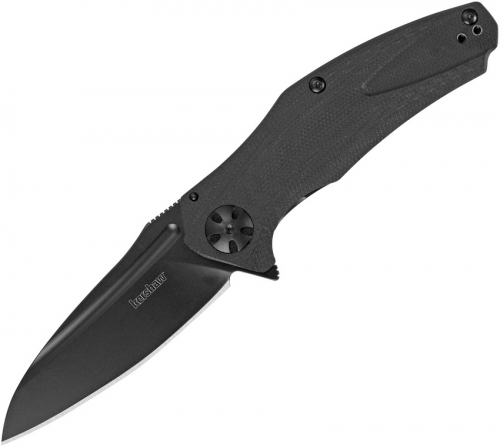 The Kershaw Natrix is based on brother brand Zero Tolerance’s 0770, which itself was inspired by the award-winning ZT 0777. This knife features a drop-point blade that offers solid performance. Accessed with the built-in flipper, Kershaw KVT ball-bearing opening makes it easy to open the knife one-handed. An oversized pivot provides an attention-grabbing detail on the front of the knife, while Kershaw patented Sub-Frame Lock secures the blade and provides a dramatic, contrasting line on the back. a decorative backspacer adds another embellishment. And finally, a custom-designed deep-carry pocketclip echoes the lines of a special recess machined into the handle to complete this good looking knife. The Black Natrix has a blade of 8Cr13MoV stainless steel, expertly heat-treated by Kershaw to bring out its high-performance qualities. Black-oxide blade coating, black hardware, and black G10 handle ensures the Black Natrix dark good looks.